The Gama Sonic Victorian Bulb GS-94B-S with a single lamp head has now been upgraded with our latest innovative technology of an outdoor Solar LED Light Bulb. This Solar Lamp will illuminate your pathway and is the perfect energy-saving and money-saving replacement for electric or gas-powered outdoor lighting. New Solar Technology: The GS Solar Light Bulb is Brand New Patent Pending Technology that takes the conventional idea of a light bulb and incorporates it into outdoor solar lamps and lamp posts. Combined with our patented cone reflector – this is a game changer that provides ample lighting with an elegant classic design. Easy Solar DIY Solution: This Victorian solar outdoor light fixture comes with all the hardware needed for mounting this unit anywhere you choose where ample sunshine is available. 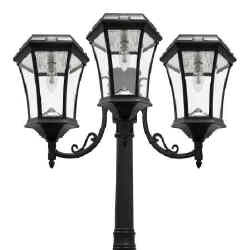 No Maintenance Is Required: The Victorian Solar Lamp Post is constructed with weatherproof, rust-resistant cast aluminum and beveled glass. The Gama Sonic Victorian GS-94B-S with a single lamp head has now been upgraded with our latest innovative technology of an outdoor Solar LED Light Bulb. This Solar Lamp will illuminate your pathway and is the perfect energy-saving and money-saving replacement for electric or gas-powered outdoor lighting. Classic Design Meets Modern Energy Efficiency: This rust-resistant cast-aluminum solar lantern, which features the attractive design of a 19th-century lamp is manufactured with a powder-coated black finish and beveled glass panes, and has now been integrated with our latest revolutionary technology: our Solar LED Light Bulb. 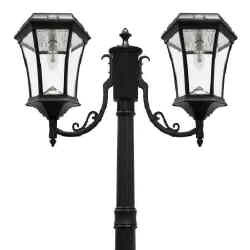 Standing 93 inches tall, this powerful Solar Lamp Post will add style and distinction wherever it’s installed. New Patent Pending LED Solar Bulb Technology: It’s powered by a single patent pending LED solar bulb. Small but powerful, this bulb automatically turns on at dusk and in high brightness mode shines at 150 lumens. The bulb not only gives your yard ample lighting, but also gives the lantern a traditional look since it resembles a standard electrical light bulb. Solar Powered: By being solar powered, it is harvesting free energy from the sun eliminating the need for using electricity or natural gas. Just set our Victorian Solar Lamp at your desired location, and let the sun do the rest. The solar lights internal Lithium Ion battery pack charges when sunlight hits the integrated solar panel. At dusk, our revolutionary outdoor Solar Light Bulb with 11 bright-white LEDs will turn on automatically and shine through the beveled glass panes at a brightness of 150 lumens on a full solar charge. Dusk to Dawn: This Solar Light fixture is designed for dusk to-dawn-operation after its battery has been fully charged during the day. If the panel isn’t getting enough direct sun to charge the battery to capacity, switch LED-brightness mode to economy mode to extend nightly light duration. 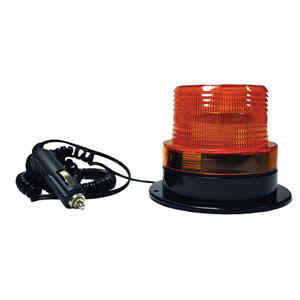 In either mode, Gama Sonic’s patented cone reflector enhances the glow and multidirectional light dispersal. It is highly recommended to secure the base into a solid surface such as concrete or wooden patio (bolts included). We highly recommend reading the instruction manual carefully to obtain the best results from your purchase.